With no danger of a seven-year itch, the seventh year of the free festival sees it growing in response to increasing exhibitor and visitor enthusiasm alike year on year. The local success story returns to Lancaster Leisure Park over May Bank Holiday weekend, Saturday 5th to Monday 7th with organisers busy slaving over a hot stove, baking up new delights to tickle local taste-buds. 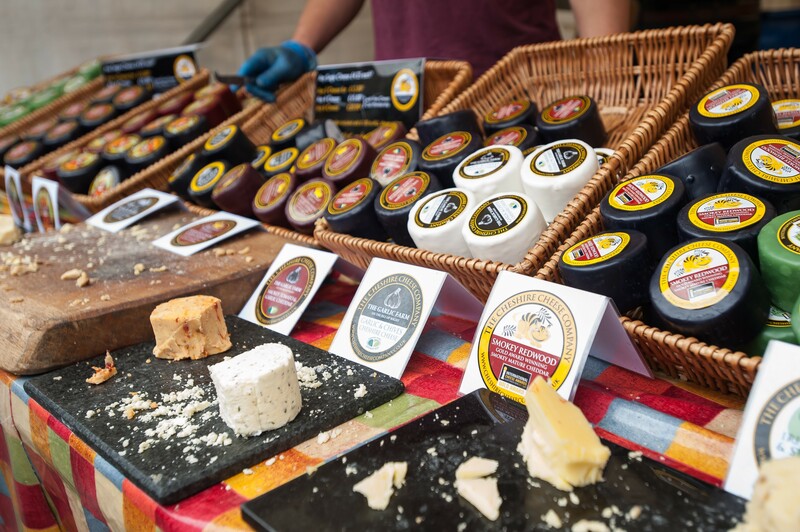 Over the three days, over 50 high quality food and drink producers will create a foodie paradise in the grounds of the Lancaster Brewery garden at the Leisure Park. Regular visitors will already be salivating at the anticipated spread, including fish, game and beef, pies, bread, biscuits and cakes, as well as artisan spices, oils, chutneys and relishes. Local food is proudly on the menu, showcasing the yummiest Lancaster and North-West produce, from farm-fresh chops and cheeses to local seafood and salt-marsh lamb. There’s also increased multicultural cuisine on offer with international inspiration from stalls selling Jamaican, Spanish, Indian and Italian foods. With stalls and marquees packed with demonstrations, advice, and free samples, there’s plenty to taste, enjoy, and take home for great gifts or self-indulgent treats. Keep fuelled as you browse with an abundance of succulent street food too: juicy burgers and pulled pork, pancakes, paella, oven fired pizzas, and Indian food, with plenty of seating to rest tired feet! If you’re leaning more to “Queen Vic” than “King Edward”, there’s plenty of liquid refreshment, with vat-fulls of local craft beers, ciders, delicious fruit cordials and juices, and locally ground coffees to quench your thirst. Little ones haven’t been forgotten either, with balloons, face painting and indoor soft play to keep everyone entertained. All the leisure park’s attractions are open throughout the event, including Giggles Play and Adventure, Countrystyle Meats Farm Shop, and GB Antiques Centre. There’s also music and entertainments into the evening at the Brewery. Running 12 noon to 6pm daily over the weekend with free entry and free parking, the seventh annual Lancaster Food and Drink Festival will be a great May Bank Holiday day out for all the family.